In Desert Hot Springs before the main intersection of Palm and Pierson is Desert’s Finest. In what was once an abandoned building which used to house the neighboring Thai restaurant is now hub of cannabis commerce. 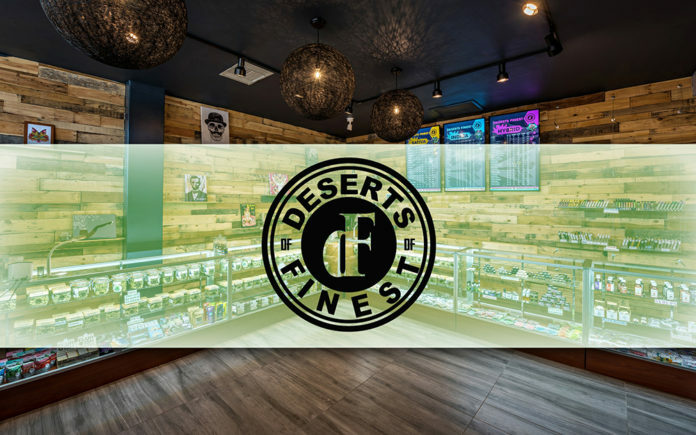 Desert’s Finest rebuilt the entire space to accommodate their dispensary using repurposed wood and slate colored walls. They created a parking lot where dirt once was and have revitalized an area which was prior subject to homelessness and illegal activities. Today when entering Desert’s Finest you have the opportunity to learn about cannabinoids and terpenes from the educational posters adorning the walls from various different brands and refresh yourself with a slurpee machine. On the wall is a chalkboard listing their upcoming in store events featuring discounts on products by the various brands they carry. The security guard checks you in with your ID and you are welcomed into the showroom. Display cases full of flower wait for you behind the door and budtenders are quickly tending to the needs of their clients. Old, young, tourist and locals are crowding the showroom and asking the educated budtenders about what brand they trust, use, and for suggestions. The selection offers a wall of vape pens, flower, prerolls, concentrates, CBD and other cannabinoid rich products, bath bombs, and more. I caught up with Reina, one of the budtenders at Desert’s Finest, and asked her about her experience working for Desert’s Finest for the last year. Read on to check out our interview below. What are the most popular products by demand? Edibles are the most popular and flower too, specifically indica flower. What brought you to the cannabis industry? What keeps you in the industry? I have scoliosis and my younger sister suffered from anxiety and depression so cbd and thc has helped us both but honestly the patients make me wanna stay in this industry. All the patients are memorable because we speak to each other like if we already knew each other already. I have gotten the sweetest and the most dry patients. How does Desert’s Finest stand out from other dispensaries? Desert’s Finest really has that city environment and so much stuff to look at, you can’t just leave with one thing. Desert’s Finest is a really unique store. You get really different people, different products, and a different experience catered to you every time. My favorite product will be concentrate. Brands I like are some Raw Garden sauces, Cali Green Gold shatter, or Flavor shatter. What is your favorite terpene? Valencene is my favorite terpene, for some reason it always gives me that body relief and euphoria that I’m looking for after a long day. You can visit Desert’s Finest at 12106 Palm Dr. in Desert Hot Springs.